On a late October day, the first waves of the striped-bass fall migration that had earlier passed by Montauk showed up along the New Jersey beaches. This coincided with pods of peanut bunker moving down the coast. It was a slightly overcast morning on a Mantoloking New Jersey beach in late October, working birds alerted surf fishermen to an on-going striper blitz. The surf fisherman waded out into the surf trying to cast to a pod of peanut bunker slowly moving south. They were catching stripers for a while, but soon the action moved past them. About a hundred yards to the south another surf fisherman was waiting for the blitz to get to him. It soon did. He was using a rig that consisted of a single treble hook, with an egg sinker located about 15 inches above the hook. This was a bunker snagging rig. When the pod of peanut bunker came within range, he cast it out into their midst. He quickly snagged a peanut bunker. He stopped and let the snagged peanut bunker fall to the bottom. His rod bent sharply and he was onto a fish. Within a few minutes he landed the fish, It was a decent size striped bass. The fisherman quickly unhooked it and released it. He then cast out again. Soon he had another, which he also released. Then the the pod of peanut bunker was past him. He jumped in his beach buggy, and drove down the beach to try and intercept the blitz at another point. Other surf fishermen were joining the chase. But now the pod of peanut bunker had moved out. It was now in range of boat fishermen. Soon they were catching stripers. They were likely also using snagging rigs cast from their boat. Many boats have livewells with circulating water. Then snagged bunker can be put in the livewells. Then they can be fished on other rods rigged with circle hooks. Then if you want to release a striper, you can do it with less chance of harming the fish. On this same day, stripers blitzing on both peanut bunker and adult bunker, were reported all along the New Jersey Coast, from Sea Girt to Atlantic City. shore, with fish on them and birds signaling their presence, are not every day occurrences. Between these eagerly anticipated events, fishing for striped bass goes on along the New Jersey coast. In the late fall boat fisherman troll for stripers using bunker spoons, deep diving stretch plugs and umbrella rigs. Others catch stripers drifting live Spot, especially around the Barnegat and Absecon inlets. Surf fishermen fish the surf with bunker chunks and clams. The best times are near daybreak and around sunset. In the late afternoon, stripers that have been staying out in deeper water to avoid the sun (striped bass do not have eyelids) come back into shallow water to feed on whatever has been uncovered by the pounding surf. They come in close. Most surf fishermen put out two rods, one cast in close, and the other further out. Often the closer in one catches the stripers. 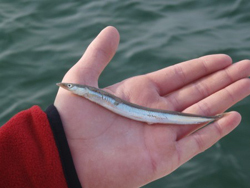 Another exciting time in the fall is when sand eels show up along New Jersey beaches. You can often see the sand eels as they sometimes beach themselves in the process of fleeing striped bass chasing them. A diamond jig, like an AVA17 or 27, with a green tube on it's hook, is a good choice at these times. Add an olive and white teaser ahead of the AVA, and you might catch a double header. Both the AVA and the teaser are good imitations of sand eels. The AVA is easy to cast, takes the rig right down to the bottom and stirs up sand during the retrieve, just like the sand eels.